"Note: File blocks can be ignored if they don't cause problems with the game." "INFO] Blocked loading of file: "C:\Program Files (x86)\HiAlgo\Plugins\BOOST\HookDll.dll". " Ps:eu usei o hialgo switch e ele funcionou, o erro é so no hialgo BOOST. Ps: I used the hialgo SWITCH and it worked, the error is only in hialgo BOOST. This is very strange, because both HiAlgo SWITCH and HiAlgo BOOST use the same Hook.dll, as I remember. Isso é muito estranho, porque tanto o HiAlgo SWITCH quanto o HiAlgo BOOST usam o mesmo Hook.dll, como eu me lembro. This message, "Blocked loading of file: "C:\Program Files (x86)\HiAlgo\Plugins\BOOST\HookDll.dll", most likely, comes from anti-cheat software, BattlEye. But then it should have blocked Hook.dll in both cases. Esta mensagem, "Bloqueado carregamento de arquivo:" C:\Program Files (x86)\HiAlgo\Plugins\BOOST\HookDll.dll", provavelmente, vem de software anti-cheat, BattlEye. Mas então ele deve ter bloqueado Hook. dll em ambos os casos. I do not have a solution for you. Maybe you can disable BattlEye, if you are playing locally? Eu não tenho uma solução para você. 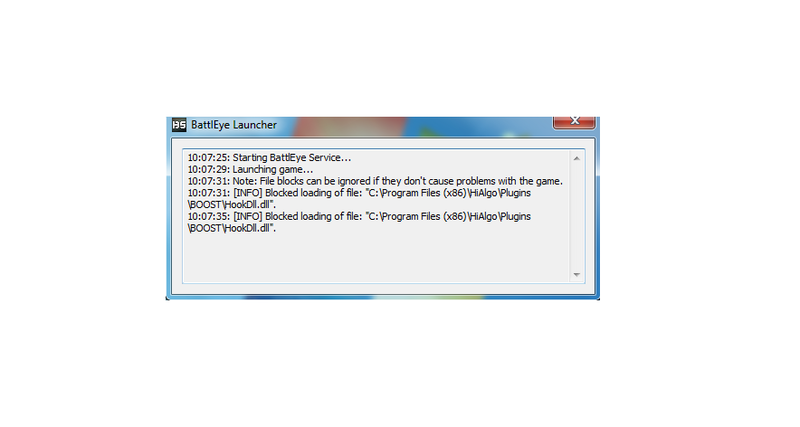 Talvez você possa desabilitar o BattlEye, se você estiver jogando localmente?